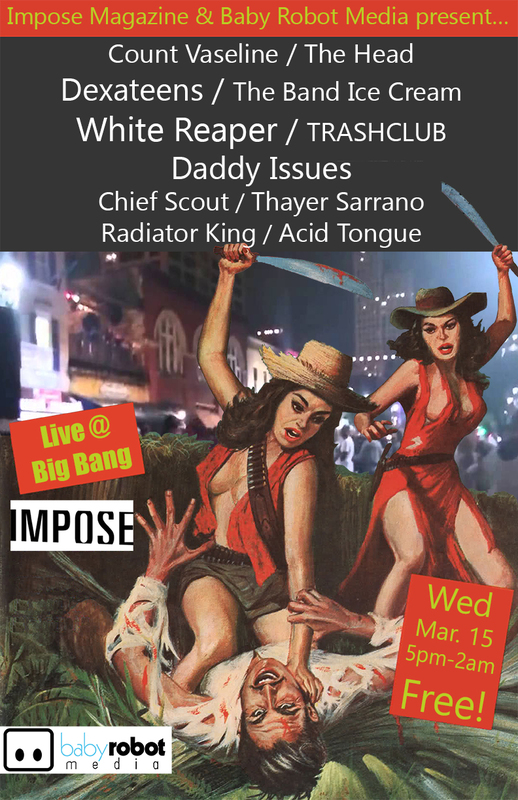 Impose Magazine and Baby Robot Media are happy to announce their unofficial SXSW showcase, featuring White Reaper, Daddy Issues, The Dexateens & more. The showcase will take place at Big Bang (412 E 6th St.) on Wednesday, March 15 from 5 PM – 2 AM. No cover charge, no badge required. Look out for Count Vaseline, The Head, The Dexateens, The Band Ice Cream, White Reaper, TRASHCLUB, Daddy Issues, Chief Scout, Thayer Sarrano, Radiator King, and Acid Tongue!